As any student of regular expressions knows, the regular expression engine has no understanding of the meaning of the characters it matches. The engine can match “A” or “B” but it doesn’t understand the relationship between “A” and “B”. It can match 1 or 2 but it cannot tell you that 1 + 2 = 3. 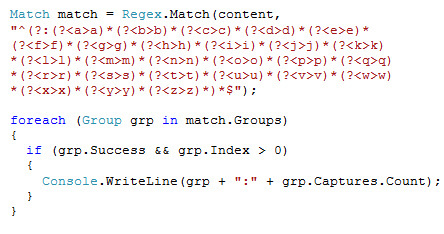 However, regular expressions are very good at quickly matching text and this can be used to obtain some related information, such as how many instances of a capture group were found. A Regex can be created based on this which will tell you how many of each letter occurs in a string. Consider the following example. Against this, run the following code block with the string above as the content. Each letter has its own named capture group allowing zero or more repetitions. The number of captures of each letter-specific group is equal to the number of letters in the string. This can be extended to count specific words, words starting or ending with specific letters, or any other pattern-based categories.